Adjustable deep brown leather strap. 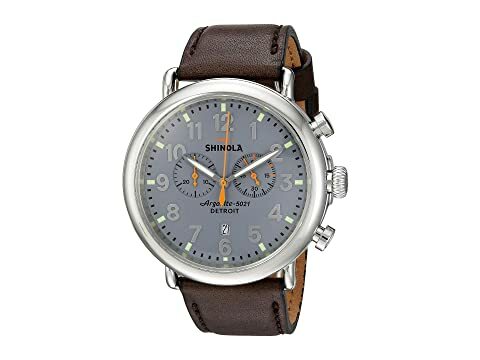 We can't currently find any similar items for the The Runwell Chrono 47mm - 10000167 by Shinola Detroit. Sorry! absolutely beautiful timepiece! quality and style that keeps the compliments rolling in! I picked this up as an anniversary gift for my husband after admiring it in a Nordstrom display case for a few months. The watch itself is very sharp in person - the chrome and detail in the face is eye catching and it has a good weight to it - substance without being too heavy or clunky. The slate blue face makes it versatile to wear. As the buyer, I was thrilled with the overnight shipping from Zappos and the snazzy wooden case it arrives in. Very happy with this purchase!